For those who haven't played, Castle Crashers is a side-scrolling beat-em-up where four little men travel to and crash through castle walls. Castle Crashers Remastered will be coming to the Nintendo Switch and PlayStation 4 this (Northern) summer, ported by PlayEveryWare. The original game launched on the Xbox 360 in 2008, PlayStation 3 in 2010, and PC/Mac in 2012. Castle Crashers Remastered launched on the Xbox One a whopping three and a half years ago, so the wait is hopefully worth it. I can definitely see the Switch appeal, at the very least. The Remastered version includes a multiplayer minigame, updated frame rate and textures, and all previous DLC. The Switch version features HD rumble and four-player local Joy-Con support (that is what makes this version so appealing). The PS4 version will light up your DualShock bar in the colour of your character's affinity (not so much worth playing again on its own, in my opinion). Last year, Idea Factory teamed up with developer Frontier Works to publish three new visual novels, each with three volumes and following the love triangle theme. All three titles are currently available for Steam, but it has been announced each will be coming soon to the Nintendo Switch. The trio includes Tlicoty Eyes, Katakoi Contrast, and Jakou no Lyla. Each has a different subtitle for PC and Switch, just to confuse us I suppose. Tlicoty Eyes: Twinkle Snowtime will launch on July 18. Katakoi Contrast: Collection of Branch is set for an August 22 release. And Jakou no Lyla: Trap of Musk will arrive a month later, on September 19. Happy birthday, Konami! The familiar developer is celebrating in style, with a 50th Anniversary Collection series. The series is actually three digital collections: Arcade Classics, Castlevania Anniversary Collection, and Contra Anniversary Collection. 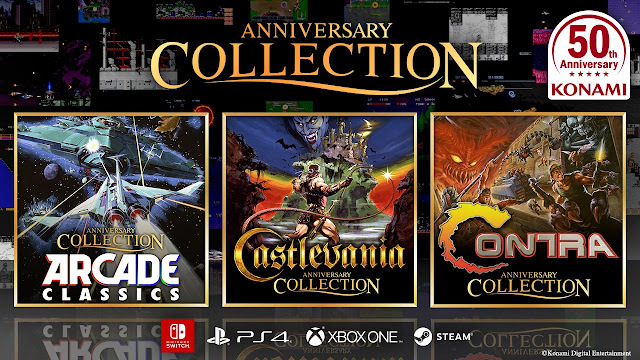 Arcade Classics is due out first, on April 18. The other two collections will follow this (Northern) summer. Each will be available for PC, Nintendo Switch, PlayStation 4, and Xbox One. My Time At Portia is coming to consoles; here's when! The sandbox simulator game (think Harvest Moon or Stardew Valley) will launch digitally and physically for the Nintendo Switch, PlayStation 4, and Xbox One on April 16. The game is already available on PC via Steam. Those who pre-order will receive a special Housewarming Gift Set, which includes an exclusive outfit, exclusive furniture, a couple consumable items, and a bag of 500 gold.